In order to enroll in the Social Security program, an applicant completed a form known as the SS-5 Application for Social Security Number, which requested specific information (shown here). The Social Security Administration didn’t begin keeping records until 1936; therefore, they have no records for people who died before then. 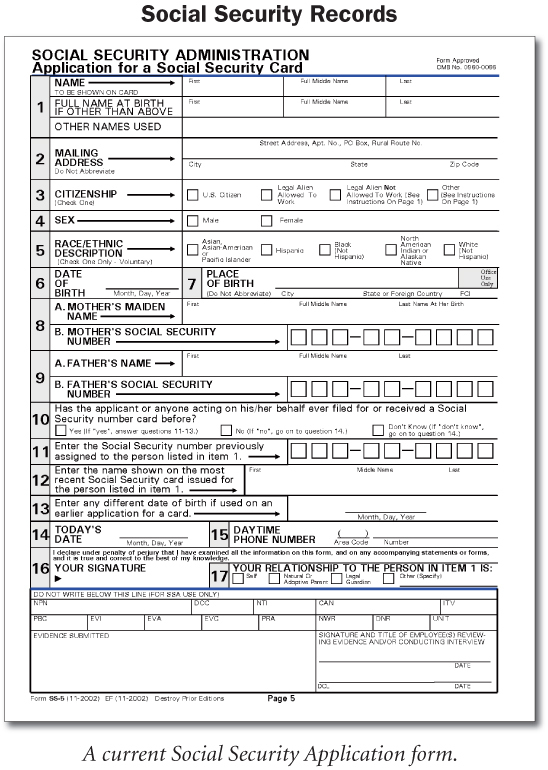 As long as a person is deceased, the Social Security Administration will provide a copy of this Form SS-5, Application for Social Security Number to anyone who makes a request. They will also release this form to the registrant (the person who belongs to the Social Security Number) and to anyone who has a release-of-information statement signed by the person about whom the information is sought. Simply send a letter (like the one shown below) and a check. If you supply the Social Security Number, the fee is $27.00. If the SSN is not known, the fee is $29.00, and you must send the person’s full name, date and place of birth, and names of parents. This is expensive, but sometimes it’s the only way you’ll find some critical information on your ancestor. Remember, this is the government we’re dealing with—therefore, the usual wait time for receiving a copy of a Social Security Application Form is 6-8 weeks, so be prepared to be patient! Who is listed in the SSDI? This database is an index to basic information about persons with Social Security numbers whose deaths have been reported to the Social Security Administration. The death may have been reported by a survivor requesting benefits. It may have been reported in order to stop Social Security Benefits to the deceased. Funeral homes often report deaths to the SSA as a service to family members. Beginning in 1962, the SSA began to use a computer database for processing requests for benefits. About 98% percent of the people in the SSDI died after 1962, but a few death dates go back as far as 1937. Note: Many records of older individuals, primarily those born in 1910 or earlier, are abbreviated records that do not contain the names of the individual’s parents and may not contain the place of birth. Step 1: Find your ancestor in the online index. Type in the your ancestor’s first and last name. Several names might come up. Choose the correct one. Copy down the relevant information. Please send me a copy of the application for a social security card (Form SS5) filed by the following person. I found the information on the Social Security Death Index at FamilySearch.org, which gathered its information from the Social Security Death Master file compiled by the Social Security Administration. I understand that the fee is $27.00 for a copy of the original application when I supply the Social Security Number. Therefore, enclosed is a check or money order for $27.00, made payable to the Social Security Administration.